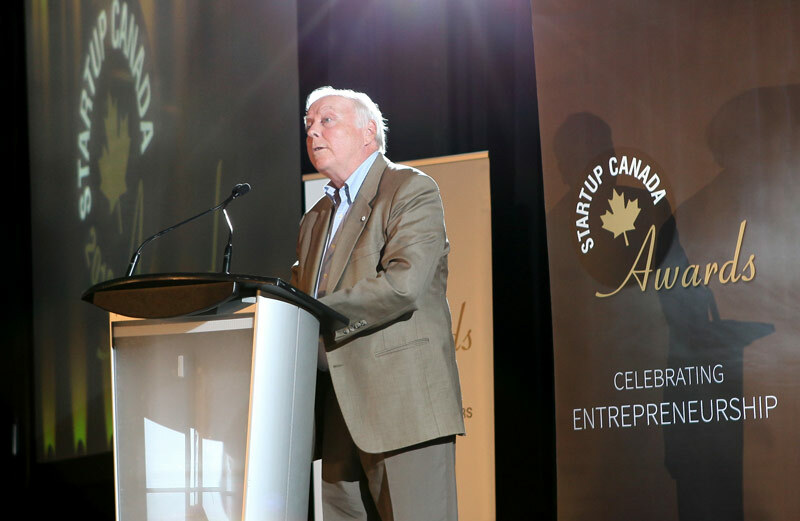 John McLaughlin, University of New Brunswick president emeritus, was recently honoured with a lifetime achievement award from Startup Canada for his work on promoting entrepreneurship in Canada. The organization saluted Dr. McLaughlin at its regional awards ceremony on Sept. 13 by awarding him with the Adam Chowaniec Lifetime Achievement Award for Outstanding Impact and Enduring Legacy in Canadian Entrepreneurship. “This recognition of John’s leadership is richly deserved. Without his work fostering entrepreneurial education inside and outside UNB, our university would not enjoy the reputation on that front that it does today,” said UNB President Dr. Eddy Campbell, noting Startup Canada’s declaration in 2014 of UNB as the country’s most entrepreneurial university. During his tenure as president, Dr. McLaughlin helped both UNB and the province of New Brunswick establish themselves as hubs for innovation and entrepreneurship. He oversaw the largest university fundraising campaigns in the history of Atlantic Canada and the largest increases in research funding of any comprehensive university in the country. In 2003, Dr. McLaughlin launched Next NB/Avenir NB, an ambitious initiative to encourage New Brunswickers to talk to each other about the future of their province. Throughout this two-year process, he helped to build communities of changemakers who continue to advocate for and are actively building a stronger New Brunswick. Recognizing that young people have the greatest stake in the future of New Brunswick, Dr. McLaughlin invited 21 emerging leaders to take part in NextNB. After meeting community and business leaders from across the province, these young leaders were inspired to take action. Based on their experiences through NextNB, they developed 21inc, an advanced leadership experience. 21inc has expanded to all four Atlantic provinces and has an alumni community of more than 120 changemakers. Through NextNB, Dr. McLaughlin also brought together many of the top New Brunswick CEOs to form the New Brunswick Business Council. The members of this council are committed to leading efforts to making positive change for New Brunswick. Resson Aerospace, founded by UNB alumni Rishin Behl (MScE ’13) and Peter Goggin (MBA ’13), received the Global Entrepreneurship Award for Entrepreneur-led Businesses Demonstrating Excellence. The national Startup Canada awards will be held Nov. 29 in Toronto.